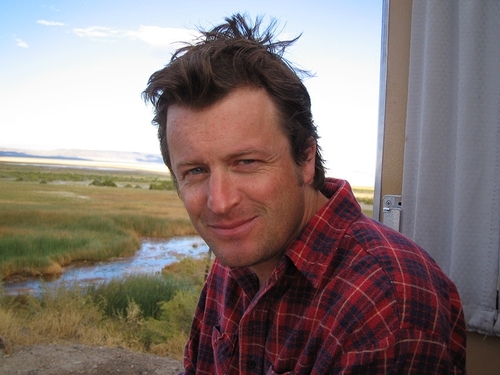 Willy Vlautin - "The goal I've always had is that I just want to write another book"
One of the great reads of 2010 (or indeed any other year), 'Lean on Pete' is the third novel from Willy Vlautin, frontman with the American band Richmond Fontaine. It tells the story of Charley Thompson, a 15-year-old with a feckless father who finds friendship in the form of Lean on Pete, a racehorse nearing the end of his days. The author talks to Harry Guerin about his work. Harry Guerin: 'Lean on Pete's hero, Charley Thompson, is a fantastic character. Did it take long to bring him to life? Willy Vlautin: Kind of. I had a song back in 2005 called 'Laramie, Wyoming', which was kind of about a kid that runs away and tries to find his aunt. So it was back then that I had an idea. I wanted to be around somebody that tried hard and got up every morning and was a good guy and didn't succumb to the dark side of human nature which he encounters. I've been going to the same horse track, Portland Meadows, where part of the book takes place, for 14 years. I fell in love with horseracing but then I started learning the darker side of it - the way the jockeys are treated and the way low level racehorses are treated. I fell in love with it so hard [that] I bought an old racehorse and I was conflicted because horses are bred for speed only and then they're thrown away when they're not fast anymore. And so I wanted to write about that and hoped that I would figure it out. HG: The beautiful thing about Charlie is that he never loses his sense of what's right. WV: I think that was one of the things that I really wanted to be around and [I] found inspiration in the kid. I was a lot like him in the sense that I wasn't rebellious. I wanted a home. I liked school. I liked the security of school and I liked having someone to tell me to come home after school where most kids are the opposite. Charley isn't a rebel; he just wants a decent life and a decent place to live. Usually my characters are really flawed inside and it was really fun to be around a kid that in my heart I knew would end up alright. HG: Up to a point in the book you think that Charley's father is just a big kid. But then there's a page where Charley recounts all that he's seen and you just go, 'Woh…'. WV: The idea is that Charley has seen a lot of stuff but he hasn't processed it yet. He hasn't the luxury or a stable enough life to be reflective. But that stuff just starts coming out of you, and I think he runs so much because when you're tired you don't think. His Dad's like a friend, like a bad friend. He's not a Dad; he's just like a cool kind of buddy that shows up once in a while and says funny things and is probably a really nice guy in a lot of ways but he's not there and he's not a father. HG: When I read 'Lean on Pete' I thought, 'There's not a word wasted here'. How many times did you read and re-read the book and pare it down? WV: I do rewrite, I don't know how many times. I probably rewrote it - taking in scenes and pulling out scenes - five times and then reading it just to tighten it up each sentence, 10/15 times maybe more. The thing I like so much about writing is that I don't have a gift with language like William Kennedy ['Ironweed' author] but what I do have is perseverance. I want to write good stories and good sentences and the great thing about being a writer is that you can just keep working on it and tinkering on it like a car until you get it to run the way you want it to run. Editing is my ace in the hole because I'll save a bad story just 'cause I hate giving up on it. HG: It's like that saying, 'Easy reading is damn hard writing'. WV: That's true. I like work. I like working on stuff. The work ethic of being in a band is touring and the work ethic of being a writer is just creating and fixing stuff by yourself. You're not bothering anybody. I like it a lot. HG: What are you working on at the moment? WV: I was hoping to write more light-hearted [material] - maybe someday I'll figure things out and I won't be such a wreck! I'm writing about three characters but my main character is a 35-year-old nurse. The novel's about how hard it is for her to see death all the time and also the life of a nurse. It's like my anti-war novel - it's not about war but the cost of taking care of the guys who come home. It reads pretty fast and it's pretty intense. Whether I can pull it off I don't know: I've written it but I think I need to tinker on it for a couple of years. And then I'm writing a series of interconnected stories about a 45-year-old gambler and a 21-year-old kid that are basically the same guy and they run into each other once in a while. We'll see how it goes - if those fail I'll write something else. HG: Have you been surprised by the acclaim 'Lean on Pete' has received so far? WV: I feel like I'm dodging bullets and I feel like I'm really lucky. The goal I've always had is that I just want to write another one [book]. I tell my girlfriend all the time, 'I don't want to go back to painting houses and I really like writing stories'. I'm in love with the whole thing about the novel [as an artform]... I'm just crazy about it. I have my favourite novels by my bed and I just look at them and it feels safer and nicer. So, for me, it's really lucky when you hear that people like the book. 'Ok, maybe I can write another one and maybe if they don't like it I'll still get to write one more before they kill me'. I like the idea of the novel and I want to be a part of it. 'Lean on Pete' is published by Faber.